He was young — just 23 years old when he died, that cold December day. Not as long as The Legal Genealogist lives. And, I fervently hope, not ever. Because he died for the cause of American freedom. Today begins the Memorial Day Weekend, a three-day holiday here in the United States, ending with a day set aside by this nation for the solemn remembrance of those who have made the ultimate sacrifice in its defense. More than one member of my family has done so in the many generations that my kin have been in America. And the first that we know of was Richard Baker. And to all who have given all that we might live free. This story also points out the importance of researching siblings. So true! Without that one reference in David’s pension application, we’d have never known. Trenton was an incredible accomplishment. Those men had to cross a river full of ice and then march several miles into the teeth of a blizzard as quietly as possible so as to not alert the Germans, which would have robbed them of the element of surprise. They had suffered defeat after defeat at the hands of the British and Germans since the Battle of Brooklyn/Long Island and been forced to retreat, and then retreat again, all the way across New Jersey almost to Philadelphia. They had limited supplies of just about everything, especially ammunition. Some had no shoes, and marched and fought with their feet wrapped in nothing more than bloody rags to protect them against the icy, rocky soil. The stories told about how the route they took to Trenton could be identified by a trail of bloody footprints in the snow are apparently all too true. Most of their enlistments were due to expire in only a few days, after which they would have been free to go home to theijr families. The temptation to depart a few days early must have been enormous, yet they stayed. Without their courageous actions in that one battle, the revolution might have ended right then. Their actions that night allowed our country another critical year of life. There’s no doubt that the event was pivotal, and the conditions as unfavorable as possible. 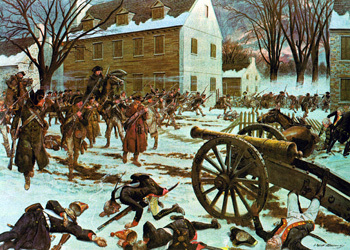 All of the stories about expecting the Hessians to be soused on Christmas grog? Nope. They were alert and responded as well as any battle-tested veterans could have. And so much could have gone wrong: Col. Rall, the Hessian commander, overlooked one chance (to move his troops to the Assunpink Creek bridge) that could easily have led to the opposite outcome. It was an amazing moment in history. I’m descended from Henry Gambill who married Martin Davenport’s daughter Mary. He also was a witness to his father in law’s will. He, Mary and children also joined the move to Wilkes County, North Carolina. Well, hello there, cousin! I’m familiar with the Gambill branch! Hello, I am the sixth great grandson of John Baker, Richards brother. It is a very proud heritage and his story will be passed down through generations. I hope that it will remain important to my family long after I am gone. Nice to “meet” you, cousin — and yes, it is a rich and proud heritage we share.